You can use Recon to create a QuickAdd package that enrolls Mac computers when it is installed. 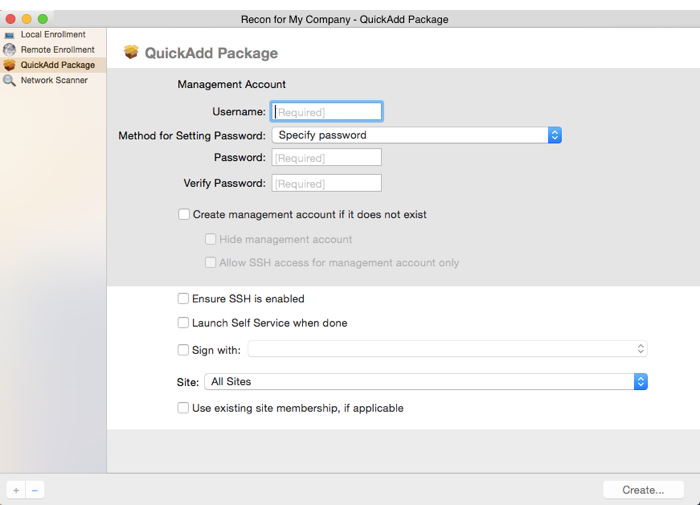 This type of QuickAdd package can be deployed using almost any deployment tool, such as Apple Remote Desktop or Jamf Pro. You can also give the QuickAdd package to users to install. Specify that the management account password be randomly generated. Create the management account during enrollment and configure settings for the account. Ensure that SSH (Remote Login) gets enabled on computers that have it disabled. Ensure that computers launch Self Service after they are enrolled. Ensure that computers that already belong to a site will retain existing site membership. Choose a site to add computers to during enrollment. To install a QuickAdd package, you double-click it and then follow the onscreen instructions. Signing a QuickAdd package ensures that it appears as verified to users that install it. It also allows users to install the QuickAdd package on computers that have Apple’s Gatekeeper feature set to only allow applications downloaded from the Mac App Store and identified developers. There are some additional requirements for signing a QuickAdd package and installing a signed QuickAdd package. For more information, see the “Requirements” section below. To install a signed QuickAdd package, computers must have a Certification Authority intermediate certificate from Apple in the System keychain in Keychain Access. For instructions on how to obtain this certificate and import it to the System keychain, see the Importing a Certification Authority Intermediate Certificate from Apple to the System Keychain Knowledge Base article. Select QuickAdd Package in the sidebar. To randomly generate a management account password, choose "Randomly generate password" from the Method for Setting Password pop-up menu. The randomly generated password will contain eight characters by default. Note: If you choose to randomly generate passwords and create the management account during enrollment, the Hide management account and Allow SSH for management account only checkboxes are not available by default. To make these options available, you need to first select the Create management account if it does not exist checkbox, and then select the Randomly generate password method for setting the management account password. If the management account you specified is a new account, select the Create management account if it does not exist checkbox and configure additional settings for the management account as needed. To enable SSH on computers that have it disabled, select the Ensure SSH is enabled checkbox. To launch Self Service on computers immediately after they are enrolled, select the Launch Self Service when done checkbox. To sign the QuickAdd package, select the Sign with checkbox and choose an installer certificate from the pop-up menu. Installer certificates that are located in the login keychain in Keychain Access are displayed in the pop-up menu. Note: The pop-up menu also displays application certificates that are located in the login keychain in Keychain Access. It is important that you choose an installer certificate, not an application certificate, to sign QuickAdd packages. To add the computers to a site, choose a site from the Site pop-up menu. To ensure that computers that already belong to a site will retain their existing site membership, select the Use existing site membership, if applicable checkbox. Click Create and save the package. After creating the QuickAdd package, you can deploy it using a deployment tool or give the package to users to install. When the QuickAdd package is installed on computers, they are enrolled with Jamf Pro. Find out how to install a QuickAdd package using a policy or Jamf Remote.